Donald Duck. “Quacking” people up since 1934 . . . | Sally says . . . eat, sleep, work, read, play, draw, bark . . .
Donald Duck. 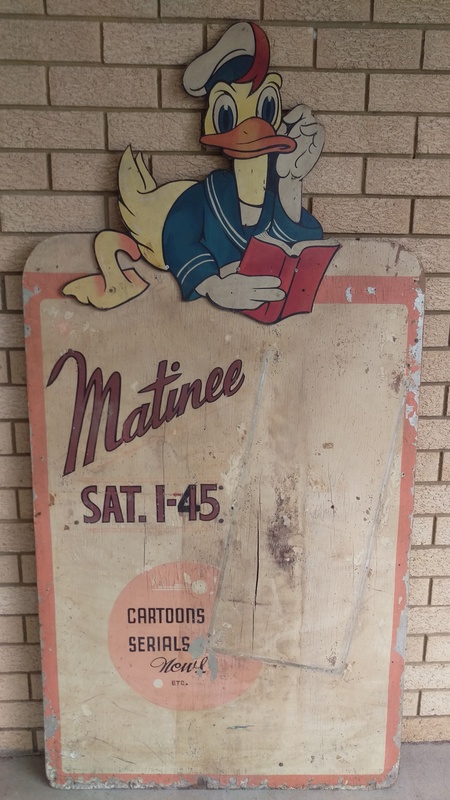 “Quacking” people up since 1934 . . .
A couple of months ago, David, the owner of our local movie house, The Plaza Theatre, asked me to do a tidy-up job on an original 1940s advertising board he had recently acquired. Having never tackled anything like that before I was a bit nervous about taking it on, but I said I’d give it a try. It took a couple of weekends and a good deal of trial and error as to what materials to use (and not to use) and many repeated admonitions to the girls of “No. NO. NO! Go over there. Go sit over there. You’re good girls, but PLEASE DON’T STAND ON THE BOARD!”, but in the end it was done, and I was reasonably pleased with the final result. It was a fun project and I enjoyed having a try at something a bit different. To cap the whole experience off, David unexpectedly gave me a bunch of free movie tickets for my efforts as well!! Woo Hoo!! A few fun facts about Donald Duck . . . .
Donald Fauntleroy Duck was created by Walt Disney when he heard Clarence Nash doing his “duck” voice while reciting Mary Had a Little Lamb. Nash voiced the character from 1934 to 1983. 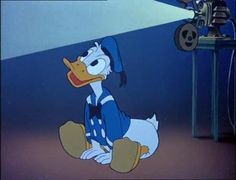 Donald first appeared on the silver screen on June 9, 1934, in the animated short film, The Wise Little Hen, dancing to the Sailor’s Hornpipe. He then went on to star in seven feature films and won an Oscar in 1943 for ‘Der Feuhrer’s Face’. Donald has an uncle (Scrooge McDuck) a girlfriend named Daisy, a twin sister named Dumbella, and three mischievous nephews, Huey, Dewey, and Louie . . .
Oh wow! You did a fabulous job! 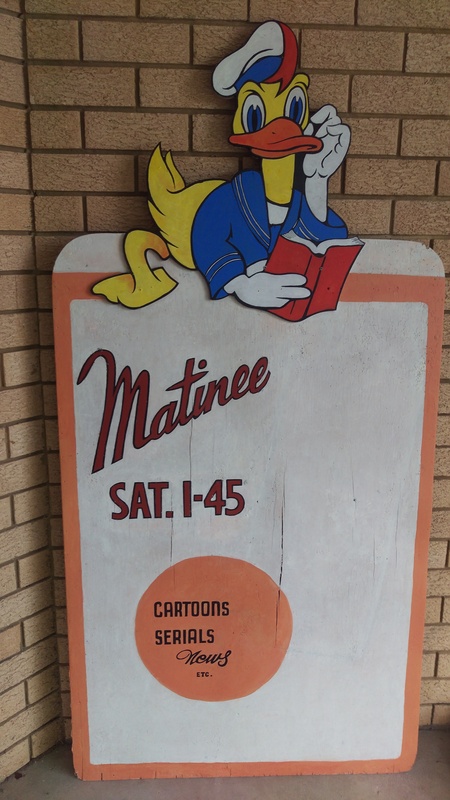 I’m a sucker for vintage things like this and I love that the owner of the theater opted to refurbish the sign rather than just replace it.